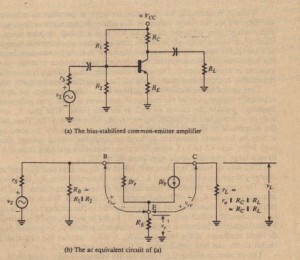 Figure 6-10 shows another bias design that is sometimes used to stabilize a CE amplifier against parameter changes. Note that the resistor IS connected between collector and base and thus provides a feedback path between output and input. For this reason, the design is called collector feedback or voltage feedback. 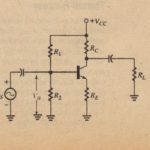 The figure also shows an emitter resistor R£ that provides current feedback, as previously discussed, but it is omitted in some designs. Any parameter change that causes to increase in Figure 6-10 also’ causes the collector voltage to decrease, because of the increased drop across Re, But this decrease in collector voltage is reflected through R8 as a decrease in base voltage. The decrease in base voltage reduces . and thus compensates for the change that originally caused to increase. 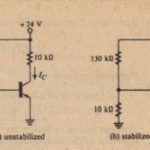 Like emitter stabilization, collector feedback also causes a loss in voltage gain. 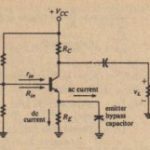 The ac collector voltage “opposes” the ac input voltage at the base. Remember that the collector and base voltages are 1800 out of phase. This is an example of negative feedback, which has many offsetting benefits that we will study in more detail in a later chapter. 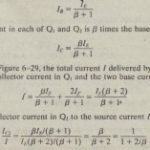 We will not take time to derive the bias and small-signal equations for the collector-stabilized circuit but summarize them here for reference. Note that the equations can be applied to the case where Rf.’ in Figure 6-10 is omitted, simply by setting R; = O.Rf ‘can also be set to 0 in the small-signal equations if it is omitted in the design or if it is bypassed with a capacitor. 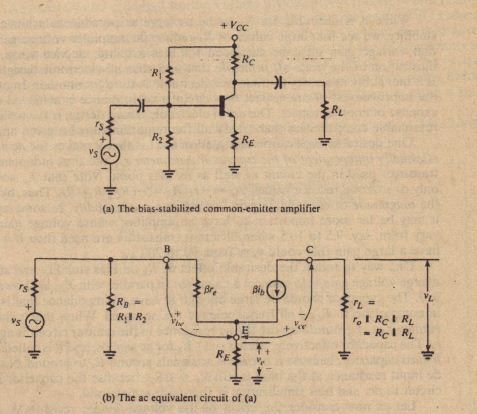 Figure JO A bias design that is stabilized collector (voltage) feedback as well (IS emitter (current) feedback.